I hadn’t really found a place for myself yet. It was important to hate on Bill Clinton, because I had grown up conservative, and it was expected of me. But I struggled with that too, because he was younger and doing things different from what I had seen Reagan and Bush do. I was flipping through try-on identities as fast as I could, and then I heard “Rage Against the Machine,” and I realized I was angry. Zach’s vocals brought all of what I was feeling to the surface and screamed it all back at me. And it felt good. Rage can be cathartic when it flows in the right direction. Watching the fellow in this video below discover Rage for the first time, catching little glimpses of the brilliant lyrics in between Morello rock riffs, reminded me a lot of my own road of discovery and how Rage shaped some of my early political identity. From Rage, it was on to Sonic Youth, The Cranberries and Bad Religion. My brother and my best friend formed a band in 1995 called Ascertaining Norman, and we all listened to a lot of mid-90’s punk bands, including Propagandhi, which, for a time, replaced U2 as the most influential and thought-provoking musicians in my life. I always wondered how these bands could play their music and prophesy at the mic and through their amplifiers and nothing would change. 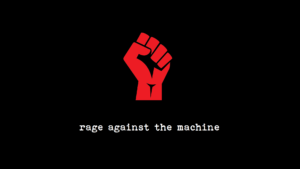 Now, two decades after I first heard Rage Against the Machine, I find myself again in need of that raging catharsis. Does rage change anything? I think it helps you to process your rawest emotions, those that pulsate and explode around places of injustice and pure stupidity. But I don’t know if rage changes anything in the long run. Maybe I just haven’t seen the level of rage needed to change things. As much as I want change, I’m not sure I want to see that level of rage. At forty-four, I’m less full of rage now than I have ever been, but I still find listening to angry music cathartic at times. That college hottie, Cheryl Carpenter, née Akimoff, sometimes gets in my car with me now and immediately turns the music way down. But as you can see from the video, there is nothing better than driving down the road and listening to something that just blows your mind lyrically and musically.